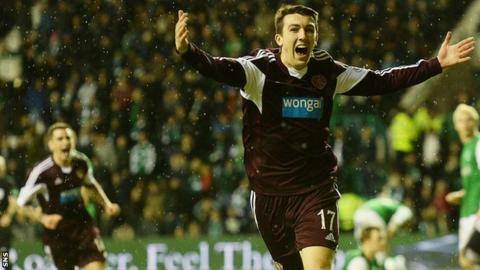 David Smith scored the winner for Hearts against Hibs in last year's New Year derby. Falkirk have made a double signing on transfer deadline day with winger David Smith signing a two-year deal after being released by Hearts. He is joined by Aberdeen defender Joe Shaughnessy who has signed on loan until January. "Joe is a big strong lad and very good in the air," Falkirk manager Peter Houston told the official website. "Because of his height, he will also give us a real goal threat at set-pieces and corners." Republic of Ireland under-21 cap Shaughnessy has made over 50 appearances for the Dons first-team, but has yet to start a game this season. The 22-year-old is predominantly a centre-back, but has been used by Dons boss Derek McInnes at full-back. Smith made 41 appearances at Tynecastle, scoring once - a second-half striker in the New Year's derby against Hibernian at Easter Road last season. Peter Houston had said he wanted to sign a striker and a defender before the transfer deadline. And the signings of Shaughnessy and Smith brings the summer recruits at the Falkirk Stadium, up to seven with Jamie MacDonald, Alan Maybury, Tom Taiwo, Alex Cooper and Peter Grant all signing ahead of the new season. McInnes told the Aberdeen official website: "The opportunities have been limited here for Joe this season and playing every week at a good level can only be beneficial for him. "We've seen in the past the benefits of players going out on loan, and Joe himself enjoyed a productive spell at Forfar a couple of seasons ago."